Used to get that hidden dirt from the carpets. Couldn’t believe how much the Vax cleared. Looked like a brand new carpet after we finished. I bought the Vax Power 3 in October last year and I hate it. It doesn't properly pick up, you can still see the dust in the carpets, and I have to get on my hands and knees to hoover my bedroom floor as it doesn't like picking up anything in there. Definitely won't be buying another one anytime soon! I have owned a VAX upright carpet cleaner for 2 years and VAX upright vacuum for 13 years the vacuum has served me well for 13 years but now sadly having to replace but once again will be a VAX .The carpet cleaner cleans my carpet like new and leaves them smelling fresh and virtually dry I would always recommend VAX appliances to anyone I also have the VAX hand steamer these products of VAX are made to last . 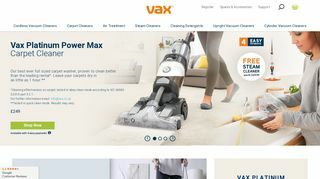 We bought carpet washer from vax 2 years ago we are really happy with our purchase they gave us good discount and carpet washer works like a dream. I had a few of Vax floor steam mops. They are a good quality but parts are too expensive compare to the price of new device. Loved for years,the wet and dry is great especially when freshening my carpets. I just bought one of these vax handheld vacuum cleaners for my elderly nan it’s nice and lightweight her other vac was far too heavy for her these have a great design and amazing suction for such a small machine I might buy myself one easier than getting the large vac out. Love the vax carpet cleaner it really works a treat! Blocked up every time I used it, overheated. Terrible. Brought myself a stand up carpet cleaner from vax and it has been brilliant. £150 reduction on the price made it even better. Wish I could award them 6 stars.